Make great-tasting seafood tacos, crab ceviche, cold seafood salads and hot casseroles and enchiladas with Crab Supreme/Jaiba Supremo. It’s made from a blend of wild caught Pacific Whiting and real Snow Crab Meat and is fat free, gluten-free and is offered in a special, 20 ounce Family Pack that is larger than traditional sizes. 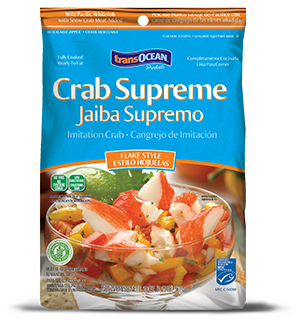 Crab Supreme delivers more value than other surimi seafood products.